Elite Stat: Cam Newton had an adjusted completion percentage of 87.9 percent, second in the league. Cam Newton is beginning to look like himself again after struggling through injury and an offense that was designed around protecting him early this year. He carved up the Lions this week and was under pressure just six dropbacks, completing 80 percent of his passes when kept clean in the pocket. Newton also continued to be used more in the run game, gaining six yards on four real carries (three kneel downs to end the game lost six yards in the box score). Elite Stat: Melvin Gordon gained 3.6 yards per carry after contact this week. Melvin Gordon gained 105 rushing yards from 20 carries against the Giants, with 72 of those yards coming after contact thanks to three broken tackles and some hard running. Gordon also added significant yards as a receiver, catching six of the eight passes thrown his way for 58 yards and a couple of scores, though he did drop one of the incomplete passes. Gordon caught passes against five different Giants defenders. Elite Stat: Antonio Brown gained 2.8 yards per route run, third in the league this week. Antonio Brown was targeted 19 times against the Jaguars, a huge number. He caught ten passes for 157 yards, but Ben Roethlisberger threw three interceptions when aiming at Brown alone in this game. Brown became the first receiver in the league to gain more than ten yards on a reception against Jaguars CB Jalen Ramsey, beating him for a long of 49 yards right off the bat and ending up with 91 yards when Ramsey was in coverage. Elite Stat: Tyreek Hill had wide receiver rating of 104.9. Tyreek Hill’s biggest play as a receiver on Sunday night was a 38-yard reception against CB Jonathan Joseph down the right sideline where he torched Joseph before dragging his feet to stay in bounds. Hill also gained another 30 yards on three more receptions, and topped his night with an 82-yard punt return touchdown. Elite Stat: Ed Dickson gained 5.47 yards per route run, the most among players at any position. In one of the most surprising big days of the week, Ed Dickson caught all five passes thrown his way for 175 yards, which is more than his total receiving totals for each of the past two full seasons. Dickson gained 89 of those yards after the catch, and would have had an even higher grade but for some suspect blocking at times over the course of the game. 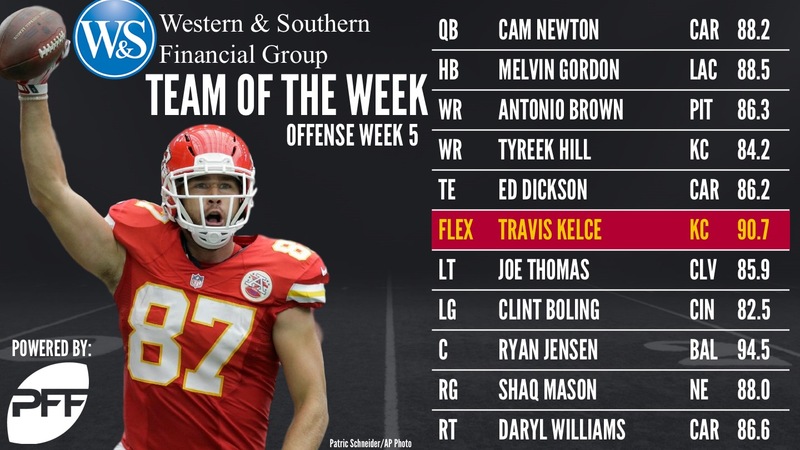 Elite Stat: Travis Kelce caught all three passes thrown his way when lined up in the slot. Kelce only played 39 snaps of a possible 77 on Sunday night against the Texans before a suspected concussion sent him to the sideline. In that time though he had another excellent game, catching eight of 11 targets for 98 yards, beating five different Houston players for catches and gaining 43 of those yards after the catch. Elite Stat: Joe Thomas didn’t allow a single pressure this week. Joe Thomas had another impeccable day as the blindside protector for the Cleveland Browns. He had a perfect day in pass protection across 45 pass blocking snaps, but also had a strong day as a run blocker as Cleveland benched rookie QB DeShone Kizer and went with Kevin Hogan for the final 34 snaps of the game. Elite Stat: Clint Boling allowed just one hurry across 38 pass blocking snaps. The Bengals offensive line struggled badly against the Bills in the pouring rain this week, with four of the five starters earning poor grades, particularly as a run blocker. Boling though was the lone bright spot, allowing just one hurry across 39 pass blocking snaps and avoiding the ugly day in run blocking in the slippery conditions. Elite Stat: Ryan Jensen allowed no pressures from 26 pass blocking snaps against the Raiders. You won’t find a much better game from a center in the league this season than this performance from Ryan Jensen. He didn’t allow any pressure all game, but it was his run blocking against a lightweight Oakland defensive front that really stood out, working to the second level and victimizing Raiders linebackers repeatedly. Elite Stat: Shaq Mason allowed one total pressure from 45 pass blocking snaps. Way back on Thursday night, Shaq Mason had an impressive game despite going up against a tough Buccaneers defensive front. Mason allowed just one hurry from 50 pass blocking snaps as the Patriots had a 2-to-1 pass-to-run ratio overall. Mason is at his best when he can be a road grading run blocker, and he drove Bucs defenders off the line multiple times. Elite Stat: Daryl Williams allowed two total pressures this week against the Lions. Daryl Williams allowed a sack and a hurry across 39 pass blocking snaps against the Lions, but he more than made up for that by run blocking well. Almost all of his best work was against Lions defensive linemen, opening holes at the point of attack by generating movement either on down blocks or by widening the edge defender to allow the Panthers backs to attack the hole. Elite Stat: Aaron Donald notched 10 pressures against the Seahawks. 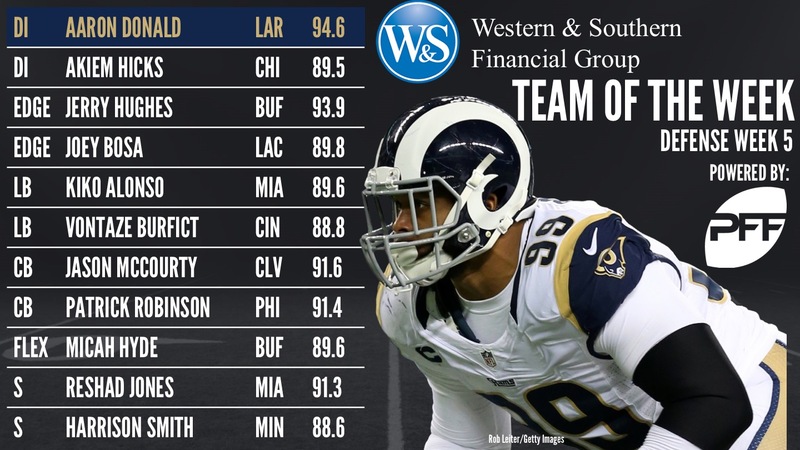 Aaron Donald was far too good for a poor Seattle offensive line to cope with this week. He had 10 total pressures over just 35 pass-rushing snaps, but also destroyed multiple run plays by penetrating quickly into the backfield, including one tackle for a four-yard loss where he just beat a combination block on outside zone and torpedoed the play before it had a chance to get going. Elite Stat: Akiem Hicks had four total pressures and two defensive stops against the Vikings. The Vikings may have won the war overall on Monday night, but their offensive line consistently lost battles, in particularly against Akiem Hicks, who had a pair of sacks, as well as a hit, a hurry and three defensive stops overall. Hicks was impressive as a pass rusher and as a run defender, and consistently overpowered the Vikings blockers at the point of attack. Elite Stat: Jerry Hughes had six total pressures from 29 pass rushing snaps. Jerry Hughes had about as dominant a game as an edge defender can have without recording a sack. He had two knockdowns of QB Andy Dalton, and four more hurries as a pass-rusher. He also notched four defensive stops in the run game and was consistently far too much for the Bengals to handle on the egde. Elite Stat: Joey Bosa had 10 total pressures against the Giants. Joey Bosa burst back to his best form this week, going up against a Giants team that has been struggling on the offensive line. Bosa ended the game with two sacks, two hits and six additional hurries to rack up 10 total pressures on the day. He didn’t have the same impact as a run defender, but when you generate that much pressure not many will mind. Elite Stat: Kiko Alonso had a run stop percentage of 15.0, third best in the league among linebackers. Far from alone on the Miami defense in having an excellent week against the Titans, Kiko Alonso had himself a fine day. He graded well in all facets of the game, notching a sack as well as leading the team in defensive stops with six overall. In coverage, he had a pass breakup and allowed just three catches for 18 yards. Elite Stat: Vontaze Burfict had a run stop percentage of 14.3, fourth-best in the league. Vontaze Burfict was a monster against Buffalo’s outside zone runs, destroying the edge of the line on his side and collapsing multiple runs in the backfield. He also notched a sack on his only blitz of the day and had a team-leading seven defensive stops and nine solo tackles. In coverage, he had a pass breakup and allowed just two catches for 12 yards. Elite Stat: Jason McCourty allowed a passer rating when targeted this week of 35.1. One of the surprise performers of the season, Browns CB Jason McCourty is having a career-year, and was once again excellent this week. McCourty allowed five catches on seven targets, but they went for a total of 22 yards, and he broke up one incompletion and intercepted the other. When thrown at this game, McCourty yielded a passer rating worse than if the quarterback had just thrown the ball at the stands instead. Elite Stat: Patrick Robinson allowed just five catches from nine targets in coverage. Another surprise performer this season at the cornerback position, Patrick Robinson has been a huge reason that the Eagles haven’t been sunk in coverage since the loss of Ronald Darby. Robinson was targeted nine times this week, and though he did allow five catches for 80 yards, he also broke up three of the incompletions and has been one of the best corners in the game at making plays on the ball through five weeks. Elite Stat: Reshad Jones had the second-best run stop percentage among safeties this week at 16.7 percent. One of the league’s best run-stuffing safeties, Reshad Jones was at his best against the formidable ground attack of the Titans this week. Jones had three defensive stops and six solo tackles in the game, but was consistently forcing cuts in the backfield with his quick reading and reacting to run plays, defeating blocks and causing problems to the blocking scheme. Elite Stat: Harrison Smith didn’t miss a tackle this week against Chicago. Intercepting rookie quarterback Mitch(ell) Trubiski to help secure a win by the Vikings on Monday night was the highlight of his week, but Smith was excellent throughout the game besides that play. He was targeted four times overall, and actually allowed negative yardage, ending up allowing a passer rating of 0.0 when he was thrown at. Elite Stat: Micah Hyde allowed 0.08 yards per coverage snaps. Though the Bills came out of this game on the wrong end of the scoreboard, they dominated when it came to turnovers, and Micah Hyde notched one of them with an interception of QB Andy Dalton off a tipped pass. Hyde also made two tackles for short gain and another for loss in a fine all around performance for Buffalo. Perfect on field goals? Check. Good from distance? Check. Game winner? Check. Adam Vinatieri did it all this week. Kern had a monster day on Sunday with four of his 10 punts landing inside the Miami Dolphins 20 yard line. He averaged 50.2 net yards per punt, the most of any punter in Week 5. Barner didn’t score on Sunday, but he did have a punt return of 76 yards. From three punt returns against the Cardinals, Barner forced a ridiculous eight missed tackles.